WASHINGTON, DC (April 26, 2018) — Researchers at the George Washington University (GW) are at the forefront of analyzing how climate lawsuits shape the nation's response to climate change. 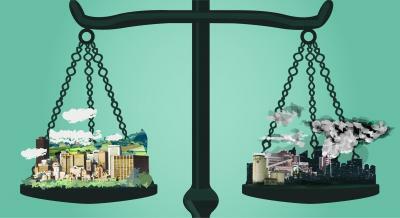 A new analysis investigates the role of health concerns in climate litigation since 1990 and finds that although health is cited in a minority of cases, it may have critical potential for protecting communities from the effects of climate change and coal fired power plants. "Many experts believe that climate change is the biggest threat to public health in the 21st century, and the courts have been and will continue to be a central avenue for the development of climate-related policy in the United States," says lead author Sabrina McCormick, PhD, an Associate Professor of Environmental and Occupational Health at Milken Institute School of Public Health (Milken Institute SPH) at the George Washington University. McCormick and her colleagues in the Milken Institute School of Public Health's Department of Epidemiology and Biostatistics, George Washington University Law School, and the university's Trachtenberg School of Public Policy and Public Administration looked at 873 judicial decisions related to climate change and coal-fired power plants between 1990 and 2016. They found that a minority of cases (16 percent) associated with those decisions referenced health issues. Health was most likely to be invoked in cases related to air pollution. Past research has linked air pollution to a wide range of health problems, including asthma, McCormick notes. The GW researchers pointed to lawsuit types that might be supported with evidence regarding health, such as renewable energy and energy efficiency included health issues. An example, they say, is the ability of health claims to help litigants gain standing to bring a case to court. In their article, they recommend the explicit statement of health benefits from reductions in impacts associated with climate change. They argue that climate change may follow examples such as tobacco and other health protections in which the courts played a central role in protecting public health. "The courts represent a pivotal branch of government in climate policy formation," McCormick and her co-authors say. "Increasing inclusion of health concerns in emergent areas of litigation could catalyze effective climate policy-making." "The Role of Health in Climate Litigation" will appear online April 26 in The American Journal of Public Health.